Though Liquidmetal has yet to make a headline appearance in an Apple product, the company continues to explore new manufacturing methods for the amorphous alloy, most recently filing a divisional patent application for a new counter-gravity casting process. 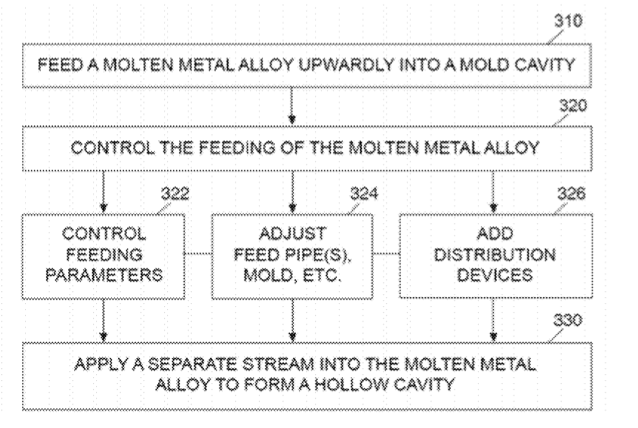 Entitled "Counter-gravity casting of hollow shapes," the application —filed in March of this year —is a division of previously-issued patent 8,701,742 of the same name. A divisional patent is one that refines or "carves out" a new invention from a previous filing. Counter-gravity casting is a manufacturing method that draws molten material into a mold using a vacuum, rather than being poured in. The method has a number of advantages over traditional poured casting, including increased yields and a simplified molding system. According to Apple's filing, one of the most difficult parts of manufacturing Liquidmetal components is controlling the cooling rate to avoid crystallization of the material. Using counter-gravity casting, the company says, allows for more precise control of temperature as well as charge amount, viscosity, injection rate, and injection pressure. Apple has also contemplated ways of spinning the mold during the manufacturing process to control the shell thickness of hollow parts, as well as a "fountain" approach to evenly distribute the material. The parts formed by these methods could have "various hollow shapes, enclosures, tubes, preforms, and other similar items." As with most of Apple's Liquidmetal-related patents, the application is assigned to both Apple and Crucible Intellectual Property, Liquidmetal's specially-created subsidiary that handles Apple's license. The companies credit Theordore A. Waniuk, Joseph Stevick, Sean O'Keeffe, Dermot Stratton, Joseph Pools, Matthew Scott, and Christopher Prest with the invention of U.S. Patent Application No. 14/198,993.